I know I promised not to talk about our loliday too much, but seeing as how food was such an integral part of our travels – and seeing as how everyone has been asking me what the best meal was, like I’m some kind of food-obsessed pig, wait what? – I thought I might as well do a round-up. The problem with American sandwiches is, sometimes you just want a crap cardboard English sandwich. Two slices of thin brown bread, an unidentifiable filling and a sorry piece of iceberg lettuce. In America, sandwiches are always delicious. They’re always made up in front of you with half a pig, a selection of cheeses, a potent mustard, pickles and probably a little side portion of crisps or soup. All that taste and flavour can get a bit much sometimes, but let’s suppose you are in the market for something incredible and fresh and hangover-destroying. And let’s suppose you’re also in the small Hawaiian town of Kailua. 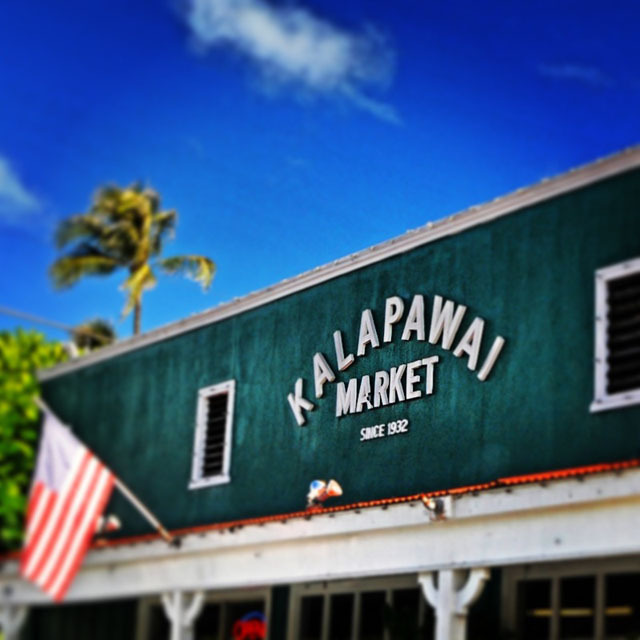 Kalapawai Market dates back to the 1930s and serves as a supermarket primarily, but with a deli out the back where you can pick up snacks for the beach or food to eat in their courtyard. The meatball sub I had here will remain engrained in my brain for the rest of all time as possibly the greatest sandwich I’ve ever eaten. Thank you, Kalapawai, for making my sandwich dreams come true. I’m always keen to gorge on mac ‘n’ cheese when I’m in the States (or Canada, in this case) and a Jewish deli is usually a good place to sniff out the good stuff. I used to be of the belief that you shouldn’t mess with the basic mac ‘n’ cheese formula, but since my lobster experience at STK in Vegas, I’ve been more open to meaty additions. 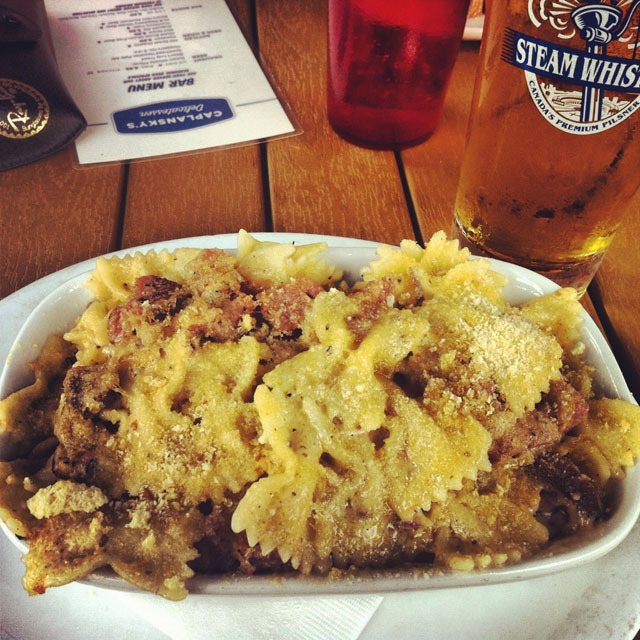 At Caplansky’s in Toronto, I had some kind of fantasy smoked meat mac ‘n’ cheese and it was bloody brilliant – especially washed down with a pint of Toronto’s excellent Steam Whistle. I’m not sure what mac ‘n’ cheese purists would make of the bow-tie pasta – not sure it can be classified as mac, really, can it? The other notable point about Caplansky’s is that the staff are completely wonderful – they gave us more Toronto recommendations than we could have managed in a year, let alone a day. The deli also sells some jaw-droppingly excellent t-shirts. 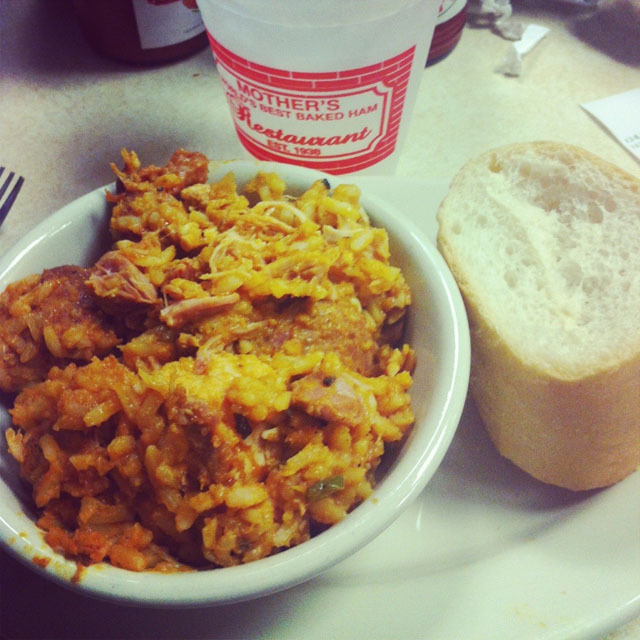 Mother’s is the only place we went back to twice, which in a food-packed city like NOLA is big news. It’s a local landmark so not some special little place we found – in fact, it’s even been on Man Vs Food – but it has a great local feel about it. You get in the queue, order, then sit and wait as head-sized hunks of pork are wheeled to and from the kitchen, salivating more and more as you anticipate the feast to come. Po’boys and baked ham are the house specialities – but it’s the debris that everyone really gets excited about. I had jambalaya and gumbo on our visits because I am addicted and was on a mission to ram as much of both in my gob as humanely possible during a two-week trip through the southern states. I only ate two steaks while we were away – which is very poor going considering we were in Texas for about a week. 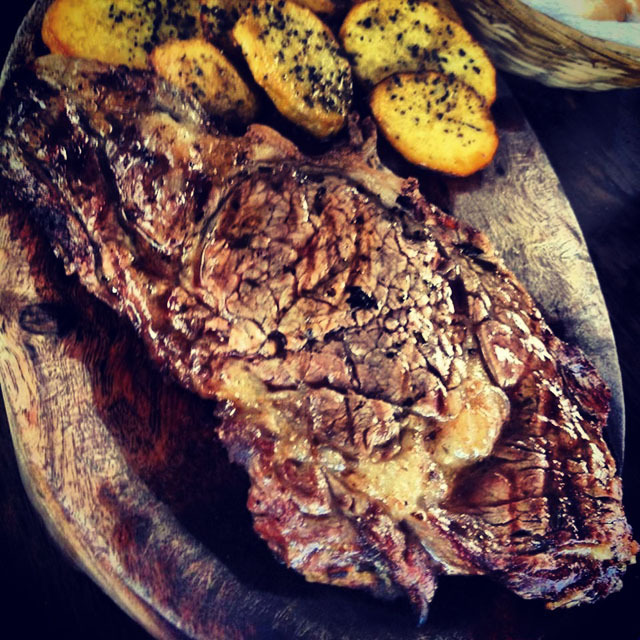 Nevertheless, the steak at La Popular Argentina wasn’t just the best of the holiday but actually one of the best steaks I’ve ever eaten in my life. Top five, definitely. 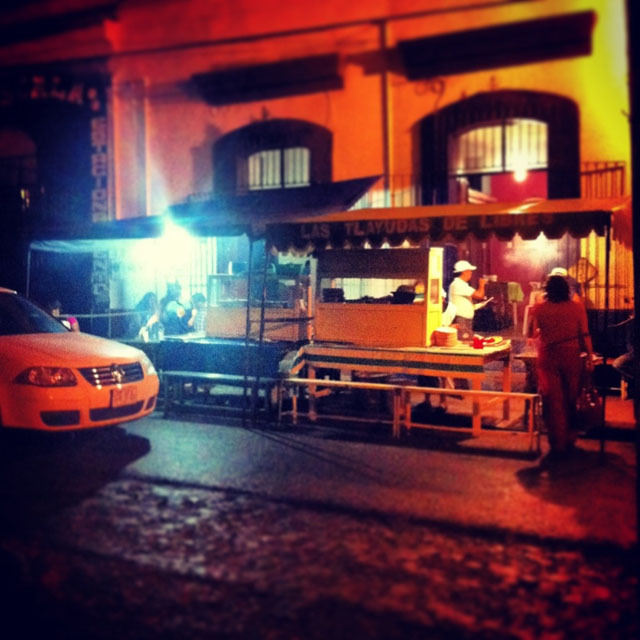 This place was right next to our hostel in the Condesa district and didn’t look like much from the outside, but it always smelt great and it was pretty cheap so we decided to check it out on our last night. I think it was about £8 for the hanger steak, which came on a bit of a wood with a pile of delicious garlicky potatoes. I went rare, obv, and although it was a tiny bit more done than I would have liked (my poor Spanish skills to blame for that) it was so delicious and tender and massive that I didn’t care. Incredible and proof, as if proof were needed, that you don’t need to eff around with a piece of meat to make it taste delicious. Fried chicken, how I love thee. I think I ate fried chicken pretty much every other day during our travels through the deep south – it’s just so bloody tasty over there, especially with the addition of Louisiana Hot Sauce. Appalled at the cost of that stuff in the UK, btw – £3 versus about 10p in sunny Tennessee. Good job I hauled a stash around in my backpack for the duration of our trip. 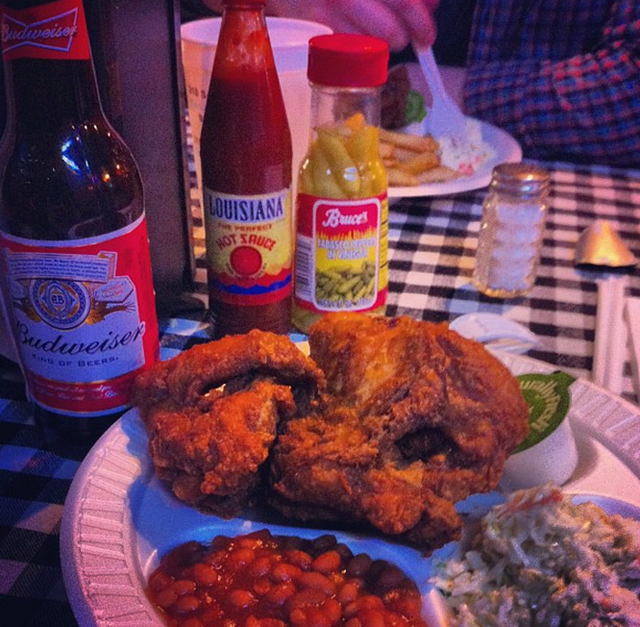 Gus’s was easily the best of all the fried chicken though, and I still dream about the crispy perfection of its batter whenever I’m hungry. Just the right amount of crunch and enough spice that you can dowse your chicken liberally in ranch dressing and not feel too appalled. I’m pretty sure the portion you see above is classed as small but it is, quite clearly, not small. They had amazing-looking desserts – pie, namely – but I had no space for such treats. Woe. This is another place we visited which has been on Man Vs Food. Watching that is making me feel a dull ache in my heart. Po’boys are so good that they get their own category all to themselves. The States (well, the mainland States) actually made up the smallest part of our trip and we were only in the po’boy regions of Louisiana/Mississippi for a week or so, but that didn’t stop me getting my fill. 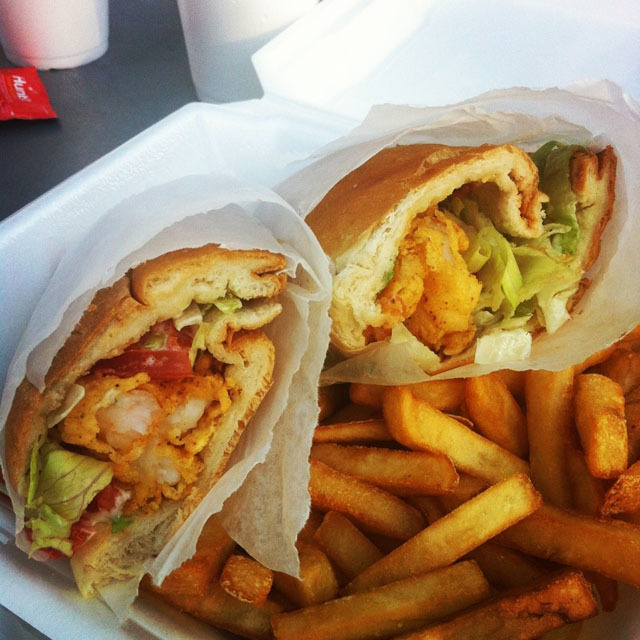 To the uninitiated, the po’boy is a French stick stuffed with your choice of filling – fish being the most authentic and shrimp, fried oysters and catfish being the bestest. You then add a gallon of Louisiana hot sauce, mayo, lettuce and gravy, if you’ve gone with a meat option. I could happily eat a catfish po’boy every week for the rest of my life and not get tired. Thank you, America, for this gift to the world. Controversially, I’d say my best po’boy was at Downtown Seafood in Baton Rouge rather than at some of the ~famous po’boy places we visited. It’s a total hole in the wall cafe set-up, but get yo’ po’boy and sit outside by the river in the sun and you’re all set. Other excellent po’boys: Parkway Bakery, NOLA – the home of the po’boy, allegedly and a damn fine spot. Everything you eat from a truck in the street in Mexico is pretty good, but Tlayudas Libres brings back extra fond, super smoky memories. So, what is a tlayuda? Other than an entirely delicious meaty thing from a truck? It’s essentially a big fried tortilla (like, pizza big) smothered with refried beans, lard, lettuce, avocado, Oaxaca cheese and your choice of meat. Actually, I guess you could make it veggie and just do away with the meat – but when chorizo the size of your arm are being smoked on the grill out front, you’d be foolish not to indulge. Oaxaca is quite possibly the best region of Mexico for food and this is a traditional local dish. Local food in Mexico is really local – so you’d struggle to get a tlayuda anywhere outside Oaxaca and all of the ingredients – meats, cheeses, flavourings – are entirely regional. We rolled along to this spot after a long afternoon of drinking – actually, we got a taxi and the minute we named our destination the lovelight beamed from the driver’s eyes – and it did the trick nicely. The picture is perhaps how it looked through my woozy eyes, but just behind the grill is a room filled with plastic tables and chairs where you sit and gorge yourself. Mmmm. Truth be told, I’ve never met a fish taco I didn’t like. California fish tacos; good. Las Vegas fish tacos; good. London fish tacos; good. Sheffield fish tacos; yet to be discovered but probably good. Still, there’s good and then there’s extra good and Fish Taco & Beer definitely falls into the latter category. 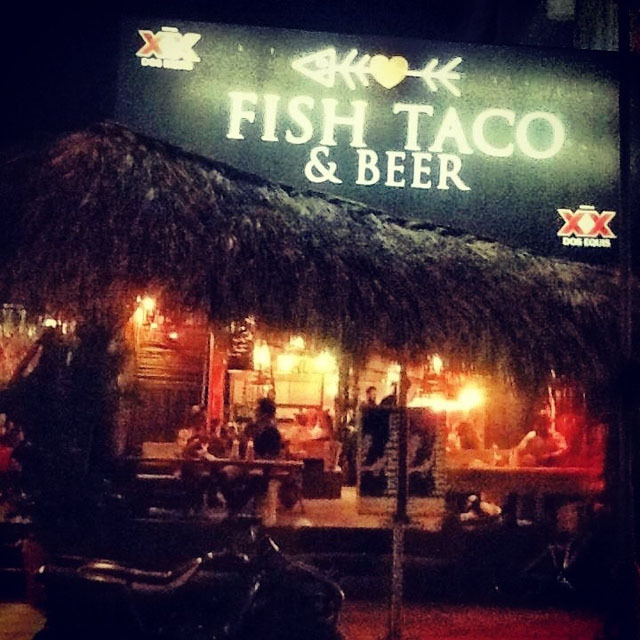 It’s very NOISY for an old person like me and attracts lots of very young and attractive people – such is life in Puerto Escondido – but if you can get past that, the food is a billion percent worth it. I believe the fish taco is called the Bubba, which 90s film fans will know means it contains shrimp and lots of it. The soft tacos and lettuce and crispy fish batter are obviously all fantastic but what makes these THE BEST is the chipotle sauce. Oh god it’s good. First time round I went subtle. Second time round I went heavy. Third order, smothered. Much like street meat and fish tacos, I’d hazard that any Mexican food that you buy when you’re drunk will taste good. Perhaps the lesson here is; all Mexican food tastes good? Anyway, Las Costillas was just a corner taco place right by the hostel and after my birthday night of lucha libre and jumbo beers it called to us like a delicious, carb-laden beacon. I’m not sure if it was 24-hours or not, but it was your classic late-night cafe set-up with bright lights and big TVs and stools on the street. I don’t recall a menu, but on the wall there was a poster advertising a mixed meat plate for some bargain sum of about £2. I wish I could tell you what the meat was on our mixed plate, but sadly the food lasted about thirty seconds and was kind of unidentifiable anyway. Let’s go with steak, chorizo and pork. That sounds about right. Chargrilled onions and a dousing of avocado and you’re all set. 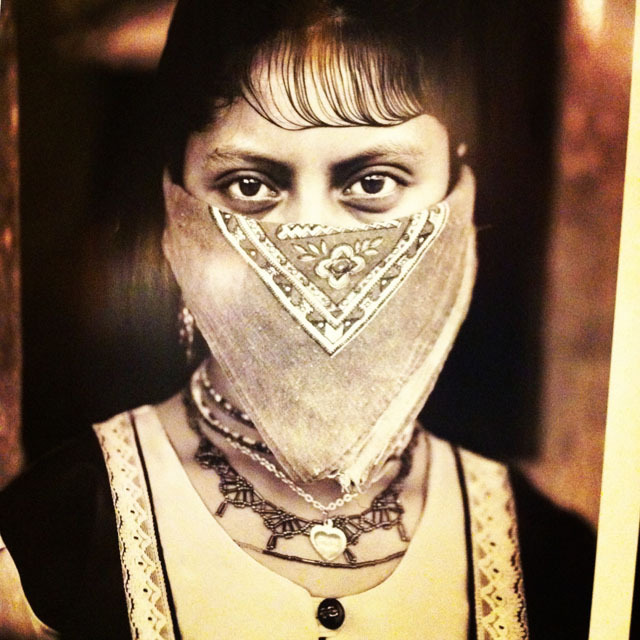 Perhaps ignorantly, I didn’t know anything about the Zapatista movement before our trip to Mexico. There’s still a lot I want to read and watch (any film recs on the subject?) but after spending some time in the heart of Chiapas, I feel like I’ve learnt quite a bit. One of the most accessible places to learn a bit about the Zapatistas is the Tierra Adentro cafe, which serves as a cultural centre, meeting place and shopping centre as well as a really good restaurant and cafe. Set around a covered cobbled courtyard, they serve up bargain daily menus and authentic regional food as well as awesome pizza… what can I say, sometimes you just want pizza. Anyway, food aside, you can read a short interview with the founder of the cafe, Ernesto, here – there isn’t much, but it covers thing like the brands that they choose to work with and the support they give to those in Zapatista communities.